Thanksgiving has come and gone, but there's still another upcoming holiday feast to contend with -- and with it, the inevitable copious amounts of leftovers. Now, you could do what most people do with them, and hide them in your secret leftover fridge so that your roommate can't find them, or you could do something extra-special: make a turkey & stuffing double down. 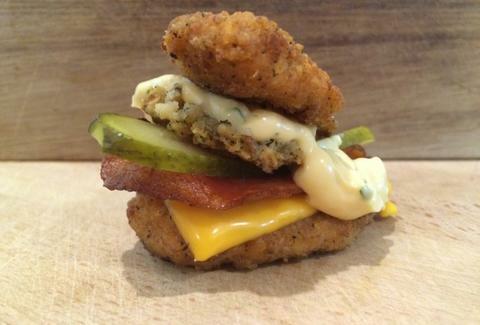 The sandwich, a brainchild of London's Duck & Waffle's Tom Cenci, consists of two breaded & fried cutlets of turkey for "buns", and bacon, stuffing, pickles, American cheese, and burger sauce for the filling. It's probably the best way to use up the dregs of your fridge after Christmas, and has the added benefit of making your roommate extremely jealous. You can find the recipe right here. Adam Lapetina is a Food/Drink staff writer for Thrillist, and thinks this makes a great gift (HINT HINT). Read his musings at @adamlapetina.